Welcome to Southwind Farm NY Come on in for a visit! We are Jim and Brenda Waite, life long farmers in both the equine and cattle industries here in our native New York. Our farm is nestled in the scenic rolling foothills of the Catskill Mountains. Land of covered bridges, lush forests, roaring trout streams and fertile farmland. As actively involved in livestock as we are, naturally we turned to the Australian Shepherd for our herding and companion needs. 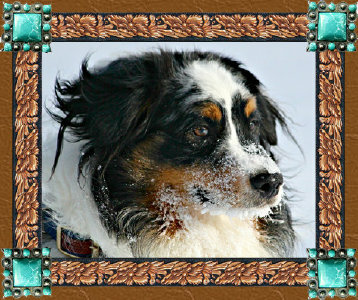 We became completely smitten with the Miniature variety of the Australian Shepherd and are devoted solely to the breed. We strive to produce the best possible disposition and structurally correct dog to meet any need; be it herding, companion, agility, or show. They are perfect partners for attending horse shows, cattle auctions, working cows, sheep, goats and miniature horses for us. We have on average three litters a year with our extended Aussie family ranging all over the US. Here at Southwind NY we have always believed in quality over quantity. We have been known for our World Class Quarter Horses and Paints for 35 years. With the decline in the horse industry we loved so much our Paint horse division has decreased. We retained our two favorite halter mares and patiently await a positive upswing for the horse world. A recent addition to our equine line up are Miniature Horses. Although relatively new to this field one of our first foal crops produced SWF Mr Spanish Oak. He has gone on to accumulate Hall of Fame points and will be expecting his first foal crop this year for Frosted Creek Farm. We added an exciting new Falabella stallion, JAC's Nuevo Vino to our breeding program in 2010. 2011 will see Falabella blend foals arriving. Take a tour through our web pages or give us a call and stop by for a visit. Coffee is always on and what better way to spend some time, but chatting with new friends about what you love best. Check back often for updates on the arrival of new puppies and foals. Especially check out our producing girls...... both equine and canine as babies go fast. We maintain waiting lists and you might want to make plans. Our motto is, "Buy um or you'll end up having to try to beat um' !" "All pictures and content is the sole property of Southwind Farm NY and use or copying thereof is strictly forbidden without owners written consent." "From puppyhood to a grown up Champion!" Congratulations Rhonda Graser and Ziggy!